The following was first published in the now-defunt Nashville American [1894-1910] newspaper (it later merged with another Tennessee paper). The tale circulated throughout the country at a time when the newly-minted State of Oklahoma was being mined for its long-held legends of Spanish gold, outlaws, and the secrets of the still quite mysterious tribes that populated the former territory. Quest of Lost Lovers' Mine. Strange Adventures of Trapper Who Found Cave of Gold and His Thrilling Rescue. The story of the most wonderful gold mine in the world and the treasure of some ancient race is regarded by at least ten men who live in the Indian Territory as gospel truth, others allowed it some degree of credit, while many laugh at it as a myth of the flimsiest character. Many lives have been lost and thousands of dollars have been spent in searching for this lost treasure of the lost lovers. Those who are best informed on the subject and who are firm believers in the existence of the mine and treasure are convinced that its location is known to two noted Indians. About two years ago a party of hunters were returning to old Ft. Still when they made a very startling discovery. Moans of distress were heard coming from a location not far from the trail. An investigation was made and the hunter found an Indian girl and a white man staked to the earth writing in agony and very near death. It was nearly night and the boys pitched their camp, hoping to save the lives of the suffering people. The captives were unbound and when restoratives had been sdministered and the dirt washed from their faces both of them were recognized by several of the hunters. the white man was John Lawthorn and the girl was Oneda, the pretty daughter of old Gotebo. As soon as Lawthorn could find strenght to talk he explained that they had been suddenly attacked, knocked senseless and bound. This occurred about daylight. Lawthorn said that he had been unting about 100 miles farther west in a lofty range of mountains. He believed that he was in a region usually avoided by Indians and known to the various tribes under several names, such as "Ghost Mountains," "Devil Mountains" and "Death Mountains." One day he followed a wounded bear into a narrow canyon, where the walls of rock on either side rose to such an immense height that the rays of the sun hardly penetrated the dark gorge. "It was a gloomy, forbidding-looking place," said the hunter, "and when I came up with the crippled bear I dispatched it at once, hoping to get away as soon as possible. After sticking the bear I went down to the little stream that roared through the gorge to wash my knife and slake my thirst. While resting a moment on the bank, I saw some little particles of gold in the bed of the stream, and being and old prospector, I glanced around and it was easy for me to see that the rocks spelled gold in every direction. Several leads of gold bearing quartz were in plain view. "My fortune's made!" I exclaimed, and was in the act of rising to make a closer examination when I noticed a lot of rectangular openings in the wall oppostie my position, reminding me at once of the cliff dwellers of Arizona. I farily ran across thes tream to look into one of these openings in the wall. It was dark as midnight inside, and, of coufse, I could not see anything until I had struck a match. then I saw nothing but an empty vault that had evidently been chisled in the solid wall by some one who belonged to a race that passed away long ago. "The room was something like the cell of a prison. it was about eight feet one way and six the other, and the ceiling was not high enough to allow a six-foot man to stand erect. I soon discovered that there were several rows of these rooms in the wall. There was one row above another until the top row was located at a dizzy height--possibly 200 feet from the base. "I was amazed and highly elated at the wonderful discover I had made. 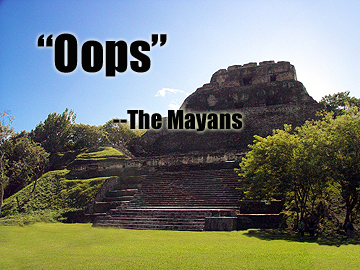 I knew that it would create a big sensation among archaeologists and other scientists. At the same time I was confident that I had found a bonanza of gold. I was about to return to my bear when I noticed one opening a great deal larger than the others. Over this door there were hieroglyphics and the gifure of a god in bas-relief. Upon entering this place I found it much larger than the others. It was about 40 feet in width and length, while the roof was almost beyond the reach of the rays of my flickering matches. On the farther side there was a great stone altar. It was four feet high and large enough for the priests to have accomplished the slaughter and sacrifice of a victim six feet in length. Behind this were towo smaller doors opening into small vaults. One of these I entered to find it different. There was a great heap of something against the wall. I held a match over it and it glittered like gold. Agitated to desperation, I broke several matches before I calmed myself sufficiently to examine the stuff closely. "It was gold. I had had long experience and I knew gold. "Trembling like one with a small child, I looked at the heap of gold dust in amazment. Why, there are two or three bushels of it, i whispered. I determined to go back to my bear and camp, hoping during the night to devise some plan to move my great find to my home. Thrusting a big handful of the glittering gold dust into one of my pockets, I turned to leave the room. "My foot struck something soft at the base of the altar, and when I placed my handon the rock for support I found that it came in contact with something sticky. Rather astonished, I struck another match. Then i was almost crazed with the scene before my eyes. The altar was wet with blood and a child 2 or 3 years old was lying dead at its base. The poor little infant's breast had been ripped open and the vital organs of its bosom were exposed. "Shuddering with terror, I fled out into the open air. I was so badly frightened I hardly knew what to do, but I determined to get away from that region as fast as I could. I ran to the bear for the purpose of gathering my accouterments. being nearly famished from hunger, I concluded to cut a slice from one of the bear's hams to carry with me. "While I was bending over the animal I was seized from behind by a strong man and pushed forward on my face. though I struggled with desperation, I was quickly bound hand and foot to a tree with my face toward the earth. I could not and did not see my captors. I could hear them moving about and talking in whispers, and I judged that there were two men and a boy. I was right as to the men, but mistaken about the boy. It was a girl, and she is here to confirm all I am saying. They made a fire and I could smell the roasting bear meat. "You can imagine how my blood thrilled with emotions when I ralized that some one was noiselessly cutting my bonds. When I was loose I turned over as easy as I could, and by the light of the stars I recognized Oneda. She had long been my sweetheart. We had planned to marry in the near future. Amazed to find her standing over me in that wild region. I was in the act of speaking when she put a finger on my lips. "Fortunately Oneda had brought my revolver and my sack of provisions. We traveled night and day, and when we reached this locality so near home I thought that we could safely camp and rest, for we were nearly dead from hunger and fatigue. "Last night while we slept sound we were again assaulted, bound and staked out on the plains to die of thirst and terror. Of course, it is easy to understand who did this, and one wonders why they did this, and one wonders why they did not slay us at once. The reason is to be found in the fact that it is unlawful for a medicine man to shed a drop of blood of his people. Again, they desired to torture us. Dboutless they sat not far away all day yesterday and enjoyed our moans and cries for aid. "Now, gentlemen," said Lawthorn, "you have heard my strange story. Every word of it is true. I promis you that is you will go with me to those old ruins in the Death Mountains, as Oneda calls them, we will find two or three bushels of gold dust and in the old temple one of the riches gold fields in the world--a place where there is a big fortune for each and every one of us." The young man had hardly ceased speaking before half of those who had been listening were on their feet eagerly offering to follow him back to the mountains and recover the treasure that he had discovered. Cooler council prevailed and a company was formed on the spot and officers elected. They returned to the fort, where two good men were appointed to shadow the Kiowa priest and his comrade. Lawthorn and Oneda were married, and, after a great feast the company set out to search for the great treasure. The caravan camped in high glee. They were confident that the evening of the next day would be spent in dividing heaps of gold dust and staking rich placer claims or locating bonanzas of gold-bearing quartz. They sat up till midnight singing, dancing, and planning a future roseate with golden dreams. The company collected about the place where Lawthorn and his wife had slept. "Why, all their clothing, boots, shoes and hats are here. If gone, they went naked," said Ferris. The boys stood gazing into each other's faces in blank amazement. Lawthorn and his wife had certainly disappeared, leaving not a sign or trace. The old ten who first heard Lawthorn and Oneda tell the story of the sacrifice of the child and the finding of the great treasure believed every word uttered by the lovers, and they will search for that gloomy canyon and the pile of gold dust as long as they are able to walk the earth. Each of these ten men wears a gold cross made from the dust Lawthorn brought from the temple. The story seems to be complete fabrication. The narrative style hints at it, but for me it is the inclusion of details that don't quite match up with the topography described--mainly these mountains 100 miles to the west. There are NO mountains 100 miles to the west, certainly none that would be described as 'lofty'. The nearest Mountains to Ft. Sill are the Wichita Mountains, but the fort is practically at their doorstep. One might as well say the it is IN the Wichitas, so I'm inclined to dismiss them. Beyond that are the nearby Quartz Mountains, but they are so close as to almost be the same range. So, either the narrator hasn't a clue how far 100 miles is or the story is an utter fabrication because beyond these two ranges of hills, nothing significantly montane can be found to the west for 500 miles. These are, after all, the Great Plains. Moreover, I'm not sure about the geneaology hinted at in the story concerning Gotebo (or Kau-Tau-Bone, as he is known to fellow Kiowa), his daughter and Lawthorn. This also isn't surprising given that I can't find more than a cursory biography on the sub-chief for whom the town of Gotebo is named. As well, I can't find a connection between John Lawthorn and Gotebo, through a daughter or otherwise. Likely this is yet another fantastic tale spun to sell papers or, as was sometimes the case, to entice settlement to a given area. In the Summer of 1916, The Washington Post recorded a story out of Elkhart, Indiana. Apparently a well-known haunted rectory was slated to be razed due to the fact that no one would live in the structure. The rectory, property of St. John's Episcopal Church, was by all accounts in good repair but had sat unused for a number of years because none would stay even a single night. 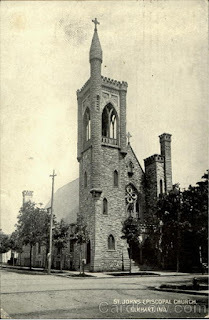 The final occupants were Reverend W. W. Daup and his wife, the latter of whom was driven to nervous exhaustion, thus cementing the rectory's reputation. A medium was brought in at one point. Through her investigation, she learned the spirit was that of a former rector's daughter who killed herself in the home. Tucked quietly just off Rome's Piazza Barberini is the church of Santa Maria della Concezione dei Cappuccini, which is lovely and historic but it's what lies beneath the structure that draws curious inside. The bones of more than 4,000 bodies decorate several crypt niches along a subterranean passage in the depths of the church. The Capuchin monks who arrived at the church in 1631 brought the remains of their bretheren and filled the crypt with soil from Jerusalem. Fr. Michael of Bergamo began the tradition of decorating the crypts in this fashion. Did Woman's Ghost Save Her Son? 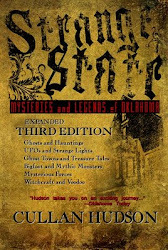 Strange State: Mysteries and Legends of Oklahoma is available ONLINE. This is the most comprehensive book on paranormal phenomena in the Sooner State. In addition to Ghosts, UFOs, Sasquatch and all else that goes bump in the night, this volume examines legends of buried gold, forgotten ghost towns, and mysterious places suffused with unexplained forces. The third edition is available on Amazon, making it easier to find and easier to purchase. YOU CAN NOW CLICK TO 'LOOK INSIDE' AND PREVIEW PAGES FROM THE BOOK!! This is your source for everything concerning the nonficiton work, Strange State: Mysteries and Legends of Oklahoma, an exciting tome covering the paranormal and strange in the Sooner State. 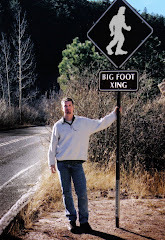 Topics include: Ghosts and Hauntings, Bigfoot / Sasquatch, UFO's, Buried Treasure, and Anomalous Archaeology. You will also read accounts and articles on paranormal happenings from around the country and across the globe. Chapter excerpts from forthcoming works and even short stories will be included as well. Cullan Hudson is the author of Strange State: Mysteries and Legends of Oklahoma, a nonfiction collection of strange-but-true tales from the Sooner State. Many of the tales included in this collection were investigated personally by the author. Hudson's short story, "The Iron Door: Curse of the Sierra Jumanos", was included in the 2005 Red Dirt Anthology and his op-ed pieces have been read across the country. Hudson is the co-author of the supernatural thriller, The Mound, a novel set in Eastern Oklahoma. A meticulous researcher, Hudson has, in one reviewer’s words, "left few stones unturned in his search for the truth." While his interest in the paranormal stems from personal experience, Hudson remains a true skeptic, demanding the rigorous application of logic to any investigation.